From the breathtaking mountains, sky and earth to the serenity and intimate peacefulness they offer... this spirit of timelessness and natural wonders which surround and fill us with a feeling of oneness... This spirit is the essence of the EL PORTAL, Sedonas luxury hacienda. Nowhere else in Sedona will you find a luxury inn or hotel with 18-inch thick adobe walls- walls that provide both quiet and history. 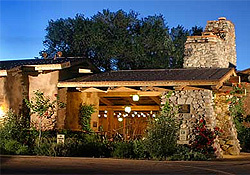 It is truly an architectural masterpiece and one of the finest hotels in Sedona. Twelve spacious rooms have been created in accordance with the simplicity and function of turn-of-the-century architecture. Each guest suite includes a private entrance, patio, fireplace, whirlpool, bath, and entertainment center with DVD, computer portal, telephone, fax and more. 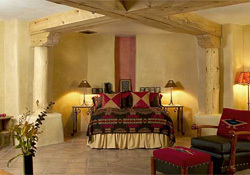 Located in the heart of Sedona, El Portal is a luxurious twelve suite, pet friendly hotel. Experience the dramatic views, relax in our romantic courtyard, shop the gift shops and galleries of the renowned Tlaquepaque arts and crafts village, or hike the red rocks. 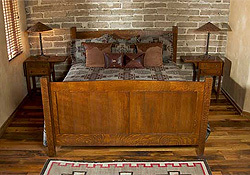 Come to El Portal for your memorable Sedona Arizona vacation! 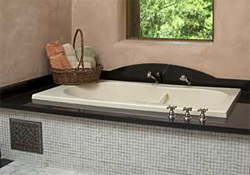 Here at El Portal, quintessential service is considered an integral part of the serenity of the Southwest experience. All of us at El Portal are dedicated to making your stay in Sedona a memorable experience so ask us anything & we will do our best to help.